Over the summer, I had the opportunity to visit the Abraham Lincoln Library and Museum for the first time. 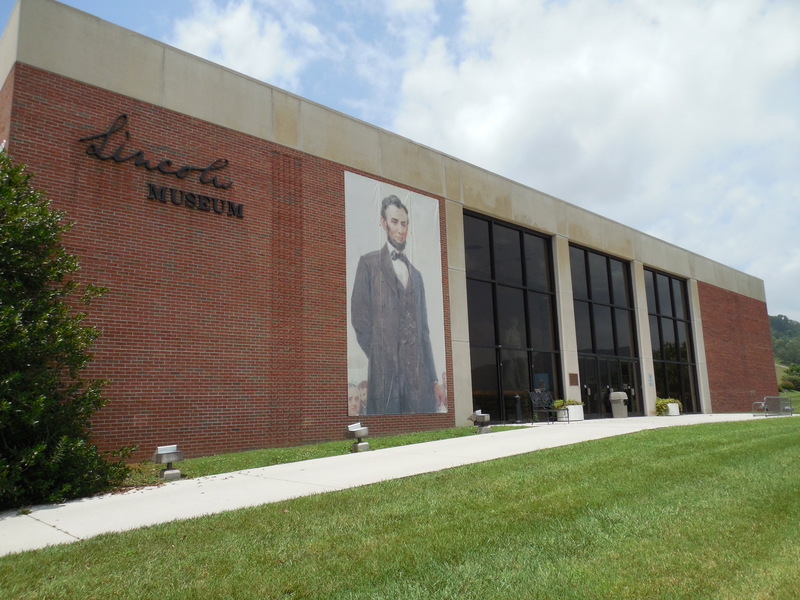 Not to be confused with the Presidential library and museum in Springfield, Illinois, this museum is attached to Lincoln Memorial University in Harrogate, Tennessee. As part of its charter, LMU has been collecting and displaying Lincoln and Civil War era artifacts since its founding. In 1977, the collection moved to its current space in the form of the Abraham Lincoln Library and Museum building. While the museum itself is very impressive and has a plethora of Lincoln artifacts and images on display, I made prior arrangements to conduct research while I was there in order to see some of the assassination related objects they have in storage. The day went by fast and I got to see and touch (with white gloves mind you) many relics connected to the death of Lincoln. I’m especially grateful to Michelle Ganz, the head archivist there who was extremely friendly and helpful during my research into the collection. One object that I got to see at the ALLM is the following letter. It was written by conspirator Samuel Arnold in 1905. Arnold, as you might recall, was a childhood friend of John Wilkes Booth who joined the actor in his initial plot to abduct President Lincoln. When that plan fell through and it was clear that nothing of consequence could be done to save the Confederacy, Arnold bowed out of Booth’s plot. Drawing of Sam Arnold done by military commission member Lew Wallace. After Booth assassinated Lincoln, Arnold was tried as a co-conspirator under the law of vicarious liability. He was sentenced to life imprisonment and served about three and a half years at Fort Jefferson before he was pardoned by outgoing President Andrew Johnson in 1869. Arnold held various jobs after being released from prison, the longest of which was as a butcher in Baltimore. In his later years, however, he retreated from the world and the humanity contained therein. He retired to farm in Ann Arundel County, Maryland where he spent his days in the presence of his animal companions. In 1902, another man named Samuel Arnold died in Anne Arundel County and the press mistook him for the Lincoln conspirator. After reading the poor obituaries he received, Arnold allowed his memoirs of his interactions with Booth to be published in the Baltimore American newspaper. Yours of the 10th at hand also Photo. I thank you for your kind wishes and trust the after part of my life, may have some little pleasures. At the age of 70 years and 6 months, I have attached my autograph to my photo, this 14th day of March 1905. Forty years have nearly passed since my young life was clouded and crushed, my reputation tarnished and character before unsullied destroyed through the venality of my country. When so robbed, after suffering agony, torture both of mind and body, incarceration in narrow cells, guarded by the Military arm of the U. States Govt. I prophesied that if convicted and deprived of my liberty by that unconstitutional Military commission (Lynch Law), before which perjury of the most glaring character as well as subordination of perjury the most dominant feature were resorted to that I would outlive each and every individual who took part in that unholy crime. How true my prophecy has been filled let the following decide. I have stood upon the river bank eagerly gazing upon Charon as he conveyed their bodies across the river Styx. The Secretary of War at that time, has long since been ferryed over. The Judge Advocate Genl and his associates have one by one passed over. Each members of the Court has followed in their wakes, accompanied by many if not all the witnesses of importance, the crowning wedge Genl. Lew Wallace lately has gone to meet his associates. Even those who zealously guarded us with their cordon of arms at the time, are with their former associates in that unknown world. Their victims are there also to meet them face to face, whilst I the only and last survivor still live, (Charon having completed his work) a sentinel upon its bank. Retributive justice has had its reward – pomp and power have been destroyed and innocence still lives, thru disease, sickness, tortures, irons, shackles, incarceration and machinations & all other evils attending therewith. Death of their victims either by the rope or imprisonment had been determined upon in the beginning, twas the intended goal contemplated for each, but I thank my God he preserved my life – a miracle, to conclusively establish that man the pigmy in his exalted power over his fellow man, to give life or death, as he may propose is powerless to enforce his edict against the power of his Creator. Every drop of ink consumed in chronicling upon the page of history of the country implying connection, knowledge or assistance rendered by me in that abominable & damnable crime, the Assassination of Abraham Lincoln, is a base lie, and fully known at the time. Preston King and Genl Lane answered their question and demands, the former by finding a watery grave the latter by the bullet. All nations are guilty of similar crimes and will again happen in serving the ambitions of man. I await my end calmly and placidly when God will justly decide the guilt or innocence of all from the blood stained Secty of War to the most abject prisoner who sat before that Court in all its pomp, splendor & power. The body dies but the Spirit lives forever. This is my consolation. At least one other letter occurred between Arnold and Fostell following the latter’s receipt of the autographed photo. 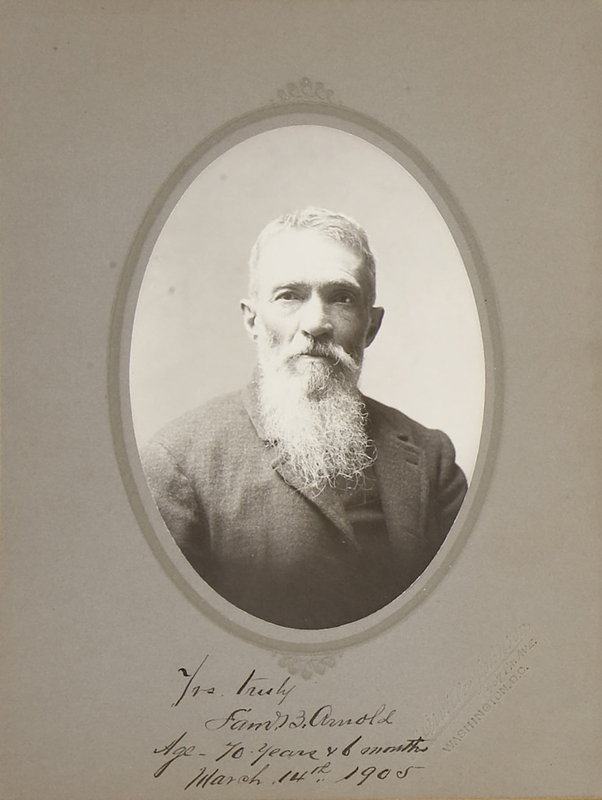 However, any further communication between the men would have been limited due to Samuel Arnold’s increasingly ill health and his subsequent death in September of 1906. It is highly likely that Al Emmett Fostell added the letter and the photograph to his personal Lincoln exhibit. The Abraham Lincoln Library and Museum contains a vast collection of Lincoln related books and pamphlets, including a rare catalog of Fostell’s exhibit. This catalog was made in 1904, before he had received Arnold’s photograph. Nevertheless, Fostell had quite an extensive collection of Lincoln artifacts, especially assassination related ones. A sampling of his collection follows below, or you can click HERE to view the whole catalog courtesy of the ALLM. Letters and portraits of Lincoln, Mrs. Lincoln, Henry Rathbone, Pauline [sic] Harris, Laura Keene, Harry Hawk, the Ford brothers, John B. Wright (Ford’s stage manager), J. E. Buckingham (doorkeeper), Joseph Sessford (ticket seller), William Withers (orchestra director), H. B. Phillips (lyricist for “Honor to Our Soldiers), Boston Corbett. A Ford’s Theatre ticket, dated March 27th, 1865, said to have been confiscated from Lewis Powell after his arrest. The ALLM has this ticket in their collection today. An original $100,000 reward poster for the conspirators. A piece of President Lincoln’s coat (the one from Alphonso Donn) from the night he was assassinated. The ALLM has a pieced of Lincoln’s coat in their collection today, possibly it is this one. Ticket to the impeachment trial of Andrew Johnson. Al Emmett Fostell died in 1920 and his collection was sold off to various collectors. To this day you can still find his name as provenance for various auction pieces that were once housed in his traveling Lincoln exhibit. 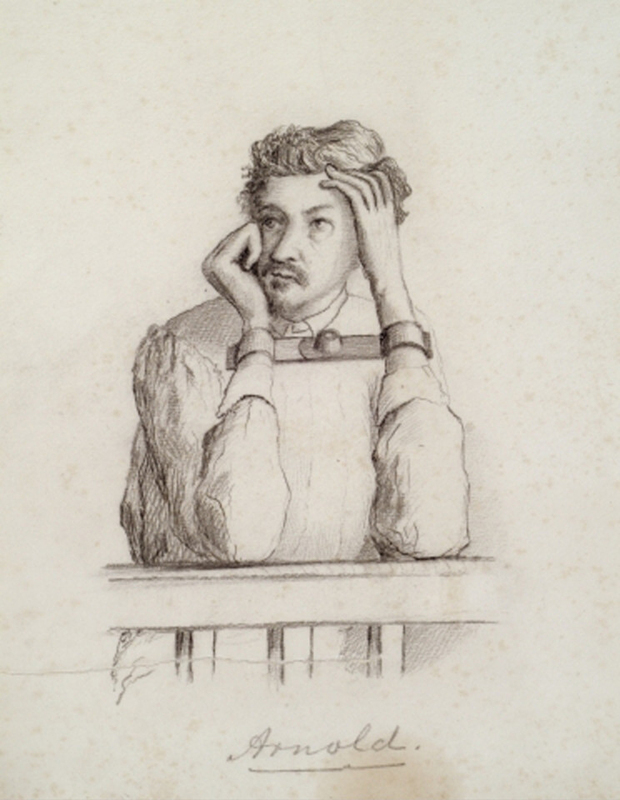 Samuel Arnold was, at times, a contradictory individual. In his twilight years he chose to retire to a farm away from mankind. He had his photograph taken incognito to “avoid notoriety”. And yet, in contrast, he released a tell all memoir about his involvement with John Wilkes Booth and his mistreatment by the government. He was also a seemingly open correspondent to anyone who wrote to him inquiring about his life. It appears that Samuel Arnold’s desire to be left alone was always eclipsed by his need to clear his name and tell his story. This letter, housed at the Abraham Lincoln Library and Museum in Harrogate, Tennessee, demonstrates that Arnold never truly recovered from the effects of 1865 and the stigma of those events followed him until his dying day. Where is the copy of Samuel Arnold’s 03/27/1865 letter in which he told Booth he was stepping away from the kidnapping venture? The police found it in Booth’s trunk the night of the assassination. Hi Dave, very interesting. I especially liked looking over the catalogue. Item # 11 says the “The Rocking Chair in which Lincoln sat when he was shot.” I am sure they mean a photograph of the chair since Fostell never owned the rocker. More interesting was item # 26 which seems to indicate that the Ford’s Theater interior photographs taken after the assassination and attributed to Brady were in fact taken by Gardiner. I noticed those things as well when I was looking through the catalog. I actually made the assumption that he had his own “Lincoln rocker” facsimile but a photograph is also a likely possibility. And at least this is some support that the interior shots are Gardiner photographs as we have debated on Roger’s site. Since Fostell got many of his artifacts from people at Ford’s there’s a good chance he knew what he was talking about with those. As usual, excellent work……or fun! You know it, Jim. I have a blast visiting museums and seeing what treasures they hold. Are we supposed to have pity on this traitor? Had he come forth and revealed what was to happen and revealed the proponents of the deadly act, perhaps the sad history of reconstruction and it’s horrible outcome could have been averted and the nation could have been truly united after that awful, divisive war. I suppose it’s all a matter of perspective and interpretation. Arnold always claimed to have never known of Booth’s assassination plot. He signed up for an abduction and when it fell through, he left the conspiracy. Arnold was also the most vocal conspirator and called Booth out when his abduction plan was far to extravagant to proceed. I believe that, in the end, Arnold saw Booth as suffering delusions of grandeur and split with him after realizing that he did not truly have he support of anyone “higher up”. I doubt Arnold took Booth seriously after the abduction plot fell through and couldn’t believe what occurred on April 14th.